Houston William P. Hobby Airport is one of two major airports serving Houston in the state of Texas. 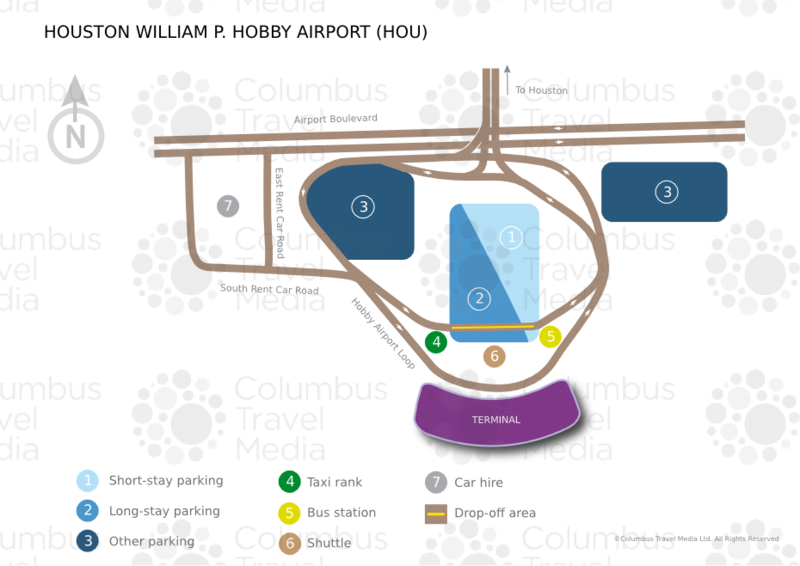 A useful resource for travellers, our Houston William P. Hobby Airport guide includes information regarding terminal facilities, public transport access and nearby accommodation options. The airport's terminal was expanded in 2015 to accommodate international flights. There are four Visitor Information Centres located on level 1 in baggage reclaim, international arrivals and level 2 both pre- and post-security. In addition, uniformed representatives are stationed at key locations throughout the terminal - these can provide medical assistance, book meeting space or suggest accommodation options. There are also five Interactive Directories situated throughout the airport providing a variety of services. An information telephone line can provide further information (tel: +1 713 640 3000). Houston William P. Hobby Airport is located off Interstate 45 (providing access from the north and south) to the south of Interstate 610, which rings central Houston. From central Houston, take Interstate 45 (Gulf Freeway) south and exit onto Monroe Road. This road leads directly to the airport terminal. The total drive time from Houston to the airport is approximately 20 minutes. Houston William P. Hobby Airport is situated 11km (7 miles) southeast of Houston. Bus: The METRO bus 40 service (tel: +1 713 635 4000; www.ridemetro.org) leaves from Curbzone 3, on the lower level outside baggage reclaim, for services into Houston (journey time: around 30 minutes). Shuttle: Shuttle services are provided by Supershuttle (tel: +1 800 258 3826; www.supershuttle.com) from the airport to various locations throughout the Houston area. Taxi: Taxis leave from Curbzone 1 on the lower level outside baggage reclaim. The journey to central Houston is between 20-30 minutes, depending on the time of day. ATMs are available in baggage reclaim, the central concourse and the food court areas. A currency exchange facility is located on level 2 next to the security checkpoint, before security. There are numerous eateries at the airport, including a Mexican restaurant, seafood bar, fast-food outlets and cafés. Shops are located in the central lobby upper level of the terminal, as well as in the central concourse and concourses A and C. Among the options are newsagents, sweet shops and gift retailers. Duty free shopping is available to international passengers in the new international section of the terminal. Luggage trolleys can be hired in the baggage reclaim area. A lost and found service (tel: +1 713 845 6673) is on-hand to assist with luggage misplaced within the terminal. A bag wrapping service is also available at the airport. There are interfaith chapels in the main concourse and near gate 40. Other airport facilities include pet relief areas, a mailbox, massage chairs and shoeshine booths. While not available within the terminal itself, meeting and event rooms for up to 150 people are available at the Holiday Inn Houston-Intercontinental Airport hotel (tel: +1 281 449 2311; www.ihg.com) less than 1km (0.6 miles) from the terminal building, and at many other Houston hotels. Free Wi-Fi internet access is available throughout Houston William P. Hobby Airport. Public pay phones are also available throughout the terminal. There is disabled access in all areas of the terminal. Visually- or hearing-impaired passengers can request information and assistance (tel: +1 713 640 3000 or TTY: +1 713 641 7781). The black airport telephones located throughout the terminal are for paging assistance. There are spaces for more than 4,000 cars at the airport. The majority of public parking is available in a four-level car park that has direct access to the terminal building. An additional surface car park is located within walking distance of the terminal. Up-to-date parking and travel information can be found on the radio (1610 AM) when approaching the airport. Additional services include valet parking and a free 'cellphone' waiting area for drivers collecting arriving passengers. For further information on parking at the airport, contact New South Parking (tel: +1 281 233 1730; www.newsouthparking-tx.com). Car hire companies: Advantage, Alamo, Avis, Budget, Dollar, Enterprise, Hertz, National, Payless and Thrifty are represented at the airport. Car rental desks are situated in the arrivals baggage claim area.